Crushed digits, lacerated body parts, fractured bones… this litany of horrors may bring images of grim Victorian workhouses to mind, but tragically such injuries are far from confined to the past. In fact, in modern day UK 40,000 such injuries, and a dozen or so deaths are sustained each and every year. And the cause? Mechanical equipment used without adequate guarding and safe systems of work. So, given that machinery is the mainstay of many a workplace, how can you keep production up, whilst making sure that your workers are protected?As the Provision and Use of Work Equipment Regulations (PUWER) make clear, any equipment used by employees at work must be suitable, maintained and inspected. 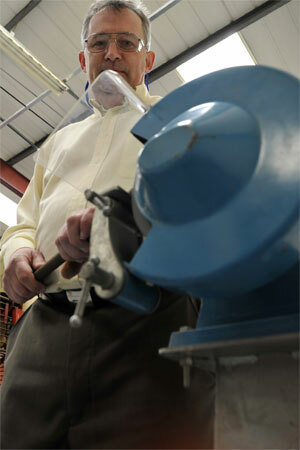 Workers must also have had the necessary machine and equipment safety training. Furthermore, just as when carrying out risk assessments, the regulations state that employers should ensure that risks are eliminated where possible, or controlled as far as is reasonably practicable. So, what protection methods are available and how do they work? Machine guards provide protection from hazards by providing a covering. The covering creates a barrier, shielding workers and preventing them from touching, or getting caught in moving parts. They also protect from sparks, flying debris and splashing chemicals. Self-adjusting guards Move automatically to allow materials of different sizes to be processed without requiring constant repositioning. Safety devices don’t use physical barriers, instead protecting workers by either stopping a machine or restricting machine operators’ movements if they get too close to a hazardous area. They tend to be employed in situations where adjustable, or self-adjusting guards might get in the way. Most protect a worker’s entire body by quickly shutting down the machinery when tripped. Others only protect the hands, either by keeping a machine from starting if a hand is in the wrong place or restricting the machine operator’s hand and arm movements. Interlocks Work in conjunction with machine guards – therefore can’t be used in situations where guards are not practical. If an interlock detects that a guard is not in place, it trips a relay switch and shuts off the power meaning that unguarded machinery cannot be used. Photoelectric devices Reliable, easy to work with, can be used in many situations. Uses multiple beams of light, which if broken trip a switch and cut the power off. Pressure-sensitive trips If a worker touches a wire or cable it trips a switch and stops the machine. Useful in areas that curve or bend as can run through eyelets. Useful for conveyor lines etc. as can be extended to desired length. Pressure-sensitive mats Usually set up to shut a machine off if stepped on/stepped off. Primarily for use in smaller areas. Restrain devices Short cables with straps attach to machine operator’s hands mean it is physically impossible to extend hands into the point of operation. Must be properly adjusted for each user. Pullback devices Permit unrestricted access to the point of operation when a machine is stopped, but pull an operator’s hands out of the way once the machine begins to move. As with restrain devices, must be adjusted for each user. Two-handed trips Two separate start buttons that must be pushed at the same time to activate the machinery – thus keeping the operator’s hands away from hazardous parts once the machine starts moving. This summa ry is taken from ‘On your Guard’, an article in the July/August issue of RoSPA’s Safety Express Journal. 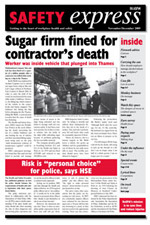 A bi-monthly tabloid style safety paper, aimed at the non-specialist, Safety Express is available free of charge to RoSPA Members, or via subscription.